Heat up a comal or skillet over medium heat, then toast the pasilla chiles for about 1 to 2 minutes, flipping with tongs as they toast. Remove from heat and place in a bowl. Season the meat with 1 teaspoon salt and freshly ground black pepper to taste. Heat oil in a large casserole or roasting pan set over high heat. Brown the meat for about 2 to 3 minutes per side. Add the toasted pasilla chiles, tomatillos, onion, garlic, chicken broth, piloncillo, the remaining teaspoon salt, and freshly ground black pepper to taste. Make sure chiles are covered with the broth. Cover and seal tight with a lid or aluminum foil. Place in the oven and braise for 3 to 3-and-a-half hours, or until meat is tender. Remove from the oven. Remove the meat and place on a chopping board. In a pot with salted boiling water, cook the potatoes and the carrots for 15 to 20 minutes, until tender. Drain and reserve. Pour all the remaining contents of the roasting pan into the jar of a blender and puree until completely smooth. Pour the sauce back into roasting pan. Slice the meat against the grain into about 1/2 to 3/4-inch slices and return it to the roasting pan. Add the potatoes and carrots, cover everything with the sauce. Cover the dish and return to oven for another 30 minutes. Remove the lid or aluminum foil, return to the oven and cook uncovered for another 30 minutes. Toss the greens of your choice with lime juice and olive oil to taste. Serve the brisket with the side salad. I just finished making this recipe, and it will be New Year’s Day dinner tonight for my family. I already had a portion while standing over the stove. It is so good, like mole almost but lighter? So good. I love your show, and thank you! Thank you, Sonya! I hope you had a yum New Year’s dinner…and have lots of yum meals throughout 2019! Love the taste and ease of the dish. But how do I get the meat to cut not to shrewd when I slice it? Before you slice it next time, Flora, let the brisket rest a little. Just made this and it was great, except brisket dried out a bit. I had trimmed most of the fat cap off of the brisket. Mistake? You do want to trim it, but do leave some fat on. But I’m glad you enjoyed it, Chuck! This is WONDERFUL. The aroma during the long cooking all afternoon made for a strong desire to dig in n eat it! Loved it. The smell is sooo amazing…so happy you liked it, Annette. Enjoy the book! Hola pati! What can I add for spice heat? I feel like it’s missing a little something to kick it up a notch. Gracias! If you want it spicier, you can add more chiles to kick it up, Mitchell. Yay! Hope you love the brisket, Maria. I have made this dish three times and there are never any leftovers. I just want to thank you for introducing me to this dish. I have never have leftovers of this in my house either…so glad you love it, Edmundo! I absolutely love your show and your connection to Mexico. I just watched the show that featured this recipe and I’d love to try it. Can you tell me if the leftovers would freeze well? Thank you! Thank you Monica! They would freeze well. Paris, I bought your cook book ( Mexican Table ) and the recipe is a little different from your cooking show .Is it another recipe. Oh yes, slightly different. Enjoy the book, Rosemaria! This looks so delicious!! I do have a question. In case I wish to tweak the recipe, or cannot find Pasilla Chiles, which other dried chiles would work for this dish? The Pasilla Chiles really do make a difference…you can usually find them online. Have fun making the dish, Carlos! I found your show while flipping channels and got sucked in. This recipe looks amazing! We love Mexican, Italian and Asian food. Thank you for doing the show and I hope to make this soon!!!! Bless you!!! Great recipe, a real highlight. I confess I grew weary of grating piloncillo, and used the spine of my cleaver to smash the cone into smaller chunks that could approximate ½ cup, filling in the spaces with some smaller remnants, then melted the piloncillo shards in 1 ½ cups chicken broth before adding it to the pot. Will never attempt to grate piloncillo again. Oh yes dissolving it is way faster. And I’m so happy to hear that you loved the recipe in spite of all the grating. ¡Hola! Could you use beef broth instead of chicken broth? Hi Patti do you have to brown the brisket before you cook it, are can you just put everthing in a roasting pan and place it in the oven. Thanks Cathy. Made this for a Seder and really enjoyed it. We are thinking of trying the sauce on chicken. Do you have any suggestions for modifying the recipe to cook on the stovetop? Hi Pat! You can cook it for the same amount of time on the stovetop, covered and at medium-low heat. hi my name is d.j first time ever seeing the show today. it was so good it got me very excited. Mexican and Italian foods are my most go to foods. i am going to watch your shows and excited to watch every back issues . thank you for your recipes. I’m so glad you discovered the show D.J.! Hi Pati! Friends and I are having a Pati Jinich themed potluck (my friend Jane’s idea)! Can this brisket be made ahead the night before? Any adjustments you suggest if doing so? Thanks! Oh how fun! 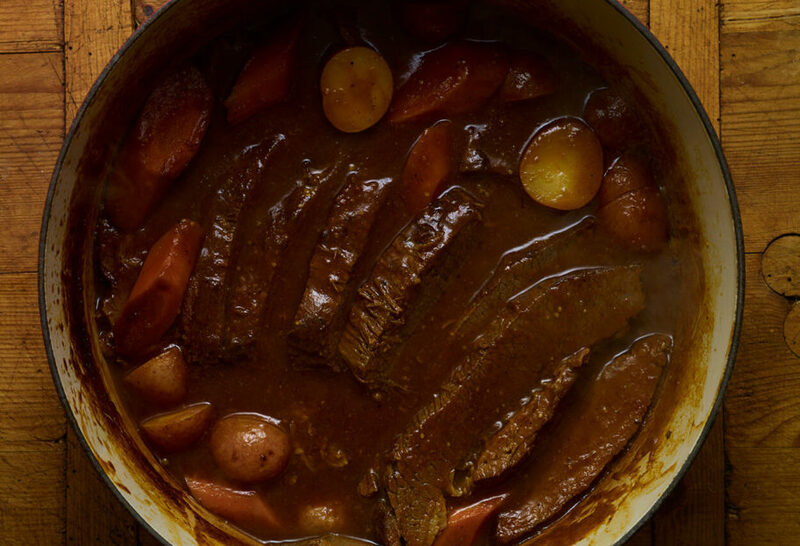 The brisket can be made ahead and reheated. It will be delicious. Enjoy! Very good and lots of flavor! My sauce came out more like a paste rather than a gravy. Any idea why? I saw this recipes a few weeks ago and I’m finally going to try to make it, but reading through the comments I have realized that the Pasilla chile I bought is actually the Ancho chile. I have checked my Latin stores and they don’t sell the real Pasilla chile. 🙁 Can I use the Ancho Chile or would it change the dish completly? Please help! Thank you for turning in Luz! As far as ancho and Pasilla Chile’s go… I know! It is so confusing that they mix them up but it really does make a difference. Maybe you can find an online source like Melissa’s or GOYA. Fantastic. The meat ws so so tender and tastey and the gravy was so wonderful we wanted to drink it. The extra gravy went well on the beef and in hot sandwiches. I love your show. Pati, Hola from New Mexico. Your show is my favorito on Create for sure! I am going to try this recipe today. I do have one question. On your video, it shows you put in raw potato and carrots to cook in the sauce with the meat during the last half hour. However, in the online recipe it states to boil the potato and carrots first. Can you clarify which is the preferred method? Thanks again for the amazing recipes. Gracias. Made this for Sunday family dinner after seeing it on the show on Saturday morning. Four star for sure. Definitely a keeper! Made the recipe exactly as written. Might use regular brown sugar next time as the piloncillo was hard to grate. Finally ended up putting it in a plastic bag and crushing it. Love your show, usually end up with at least one idea every week. Four star! Thank you Paulette! This dish is delicious and easy. I’m trying to do this in a Crock-Pot ! the brisket was too expensive , so I used ” eye of round roast” and I really hope it comes out just as amazing and yours.Any tips on working with this cut of beef and crock pot ?I followed most of the steps . I don’t have a pot for the oven yet but I couldn’t wait to try . Thank you so much , I love your show! This is a great recipe for the crock-pot! You can use a round roast or chuck or any cut of meat that loves to be braised. I was wondering if I can use pork instead of the beef brisket instead? ¡Gracias! Where do you find Padilla Chile’s ? Went to a Mexican food store and they had no clue what they were. Do they go under another name ? Oh sometimes in the US they are also called Anchos, which is super confusing…here’s some more information and pictures to help you identify the right chiles: https://patijinich.com/pasilla_chile/ You can find dried chiles online if they don’t have them at your store. Found the pasilla chilies. This recipe was wonderful. The flavor is so good. But I think I might have used to many chilies because it was spicy.will definitely make again. Thank you for such a good and easy recipe. Hi Patti! I saw this on TV the other day. I made it for New Year’s Eve. It was a hit! It was so delicious! The only thing I did different was to add a leek and I left out the potatoes and made mashed potatoes instead. It was so delicious! Thank you! I’m glad you made it your own and that it was a hit! It came out amazing, I will definitely be making this dish again for my family. Thank you ! Pati, I was planning to make this for NYE dinner but was unable to get brisket. Would using another cut of meat (ie, rump or chuck roast) work okay? Also…I made your sopes yesterday with Oaxaca black beans and tomatillo salsita, and my husband went crazy over them! We just stumbled upon your show while flipping channels the other night and are now total fans! Thank you Pati, this is on the menu for tomorrow. This is my kind of cooking (slow braise). Oh it makes a great weekend dish…enjoy! When I saw this video I knew I wanted to try it. However, at the supermarket, I didn’t find any Pasilla chiles. I did find Anaheims and got them for something else I was cooking, but I don’t think they’re even close to the Pasilla. When Igoogled them the Pasilla I found lots of confusing info about whether they are also Poblanos or Anchos or Negros. Way too much information. Not only that, some people mentioned two different kinds of Pasillas. I checked at my local spice shop and they show Pasilla Negra. Unless I hear otherwise, I’m going to go with those. But in the meantime could you enlighten us on the confusion in the naming of these and similar chiles. I’ve read and re-read the recipe but do not see When to add the sugar. I’m making it now so I hope where I decide to add it comes out ok. I couldn’t find any Pasillo chiles or tomatillos so I’m having to substitute and create. Sure hope it turns out well. Oh you can use brown sugar or piloncillo, so I use the term piloncillo in the recipe. You add the sugar after browning the meat and when you add all the garlic, onions, etc. and broth to the pot. I hope you enjoy it! Oh my goodness, this was the MOST amazing brisket I’ve ever had! Pati – Thank you so much for sharing this recipe! Thank YOU Amanda for trying and loving it! The recipe says 2 oz of dried chiles, seeded. Is that before seeding or the amount after seeding? That is before seeding them. We are trying for Christmas dinner too! The whole family saw your show, even our 5 year old, and we agreed…we have to try it!!! We all love your show. : ) Thank you for putting in so much love and happiness. I’m so glad the whole family tuned in! I hope you enjoyed the brisket and had a wonderful holiday! Happy New Year, Jerry! I hope everyone loves the brisket! Oh have a delicious Christmas, Bianca! And I hope you find a dutch oven under the tree. I dont have a roasting pan but I have a dutch oven. Do you think that would get the job done or should I go out and get a roasting pan? A dutch oven will work great too! The recipe and picture looks so delicious and inviting that I have decided that this will be our New Year’s Day dinner. Instead of adding the potatoes, I will make your mashed potato cazuela. I cannot wait to eat this! We have begun traveling to Mexico and want to thank you for your very informative program, especially when you visit restaurants. Everything looks so mouth-watering! We really appreciate what you do for your viewers. I’m so happy you have started traveling in Mexico, Barbara! I hope you love it as much as me. Have a wonderful New Year! THIS is Christmas Day Dinner! You made it look so uncomplicated that I hope I can pull it off. My mother is Mexican so I have family from Merida to Campeche to Villahermosa to DF to Monterey, but I myself am an ignorant Mexican cook…. (taco salad). My mother perks up when your show is on! Love it!! You can for sure pull it off, Romina!!! And please say hello to your mom for me! This looks amazing! I cannot stop thinking about this recipe but I don’t eat beef. I am going to try it with a pork shoulder and then shred it. Just love your show! I hope you enjoy it, Charity! My husband and I made this recipe tonight – it was so fun to make and so SO delicious! Thank you for your amazing recipes. Not only do they give my family and I fun, nourishing meals, they also connect us with the Mexican culture we have in our very own neighborhood. We shop at our local Mexican grocery all the time now! It’s the only place to get good tomatillos 🙂 Gracias! This is so awesome! Thank you, Elizabeth. Well we got started a little late in the day on this dish and just finished eating at 8 pm. It was very good and have never had such tender brisket. Pati you are our favorite – keep it up, thanks! I am going to make this for Christmas Day Dinner. You make it look fairly easy to put together, so I am giving it a go. My family on Mom’s side is Mexican so I have relatives from Merida to Campeche to Villahermosa to DF to Monterrey. However I am a very ignorant Mexican cook (Taco salad), so I enjoy your show very much, and my mother perks up when you are on Create. Oh please say hello to your mother for me! I hope you and your family have a wonderful holiday! If I want feed 8 do I just increase the meat or increase everything proportionally? Looking forward to trying this recipe! Patty mi horno no sirve,puedo preparar esta receta en la estufa,y por cuanto tiempo. ​Si! En estufa funciona también perfecto, por el mismo tiempo. Hi Pati! I love your show! Thank you for all your hard work! I have a block of piloncillo but can’t seem to grate it very easily. Is there a trick that you can share? Bought all the ingredients, will now attempt to cook it. 😂😂 wish me luck! My wife has a garlic allergy. Is there any substitute that you could recommend? There isn’t a direct substitute for garlic…but you can leave it out and/or add more onion. You said the pasilla chilies try to be hot but really aren’t. Love it. I made this Wednesday and my family went on and on about the flavors trying to figure out the ingredients. This is a keeper. Love your show. Thank you for sharing. She said it was a family favorite and now it is one of ours. An excellent recipe. Thank you. Aww thank you so much Jim! I’m so glad it is now a family favorite of yours too! Your show is my family’s favorite cooking show, especially for my 4 year old boy. We made the stew on Tuesday and the boys love it so much. My oldest even requested to pack the left over for his lunch. I will be making more of this in the new year. This is my first time cooking with Pasilla pepper and we love it. Thank you for entertaining and educating us with your TV show. I’m so happy to hear that your boys and you enjoy the show, Setia! I hope you guys have lots of fun kitchen adventures together! I’m a huge fan! Watched you cook this brisket this past weekend and was inspired to give it a try! You cook with such passion, it is contagious! It’s cooking in my oven right now and all I can say is the aroma is intoxicating! I’ve never cooked with pasilla peppers before. They smell amazing! Can’t wait to see how it turns out! Just watched this recipe on TV and can’t wait to try it. Looks absolutely mouth watering. I hope you enjoy it, Ben! I just made this tonight and I cannot describe how brilliant the sauce turned out. I had a local dark beer called Abraxas that has ancho chili, cinnamon, and chocolate so I subbed two cups of broth for the beer because why not! Thank you for bringing this into my life! Oh what a great substitution 🙂 I’m so glad you enjoyed it! Could you put the potatoes and carrots into the comal at the two hour mark and cook them with the meat, then pull the vegetables along with the brisket? ​Hi there! Absolutely, you can totally do that. I’m so glad you enjoyed it, and yes please adjust it to your taste!